Solving Cyber Risk distills a decade of research into a practical framework for cyber security. 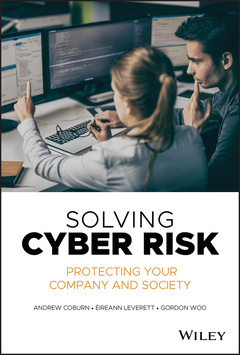 Blending statistical data and cost information with research into the culture, psychology, and business models of the hacker community, this book provides business executives, policy-makers, and individuals with a deeper understanding of existing future threats, and an action plan for safeguarding their organizations. Key Risk Indicators reveal vulnerabilities based on organization type, IT infrastructure and existing security measures, while expert discussion from leading cyber risk specialists details practical, real-world methods of risk reduction and mitigation. By applying risk management principles to cyber security, non-technical leadership gains a greater understanding of the types of threat, level of threat, and level of investment needed to fortify the organization against attack. Just because you have not been hit does not mean your data is safe, and hackers rely on their targets’ complacence to help maximize their haul. Solving Cyber Risk gives you a concrete action plan for implementing top-notch preventative measures before you’re forced to implement damage control. ANDREW COBURN is senior vice president at Risk Management Solutions (RMS) and a director of the Cambridge Centre for Risk Studies, University of Cambridge. The architect of the leading cyber risk model in the insurance industry, he is coauthor of Earthquake Protection, Second Edition. ÉIREANN LEVERETT is the founder of Concinnity Risks and a senior researcher on cyber risk at Cambridge Centre for Risk Studies. An ethical hacker, he was on the multidisciplinary team that built the first cyber risk models for insurance. GORDON WOO is a catastrophist with RMS who helped create the conceptual framework for the RMS Cyber Accumulation Management System. An authority on cyber and insurance risk, he is the author of The Mathematics of Natural Catastrophes and Calculating Catastrophe.